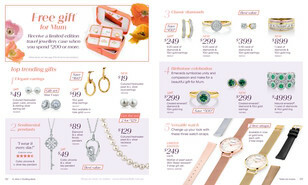 Michael Hill is a retail jewellery chain of 293 stores throughout the United States, Canada, New Zealand and Australia. 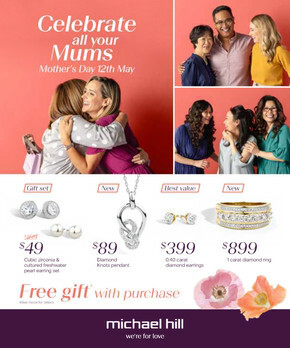 Shop online at Michael Hill to browse weekly ads and flyers to find sensational deals on engagement rings, wedding bands, watches, pendants, necklaces, earrings, charms, and more. At Michael Hill, you can expect exceptional customer service all year round. Not only are you entitled to free shipping on orders over $100, but if you’re not 100% happy with your products, Michael Hill will give you your money back. Michael Hill also pride themselves on hiring unique and passionate employees who are trained to assist you in making the right decision on your next purchase. Each employee has valuable insights and ideas; with a wealth of product knowledge to answer all your questions. Michael Hill is the perfect destination for gift shopping! Go to Michael Hill online and shop by price (gifts under $100, $250 and $500) or occasion (birthday, anniversary, graduation etc). All orders are gift wrapped for your convenience. Visit the Shopfully website and app for up-to-date information on store locations, opening hours, and to browse the latest catalogues.